When results are not immediate, energy can decline. Most agents check out in November and December - nobody's buying, the market's bad, I need a break, Woe is me! Not us. Months 11 and 12 in the pattern of our cycle don't always yield abundant results, but they are critical to our success in the other 10 months of the year. You may feel like you are pushing in the dark with the results you garner this month and next, but please don't under estimate the value of your prospecting. Attending parties, hosting open houses, daily phone calls, blogging twice a week, and daily interaction on your social media channels WILL get you business. The key is consistency. Set contact goals in numbers, and be sure you reward yourself for achieving them. Focus on the proper activities, not the outcomes. Activities now. Outcomes later. 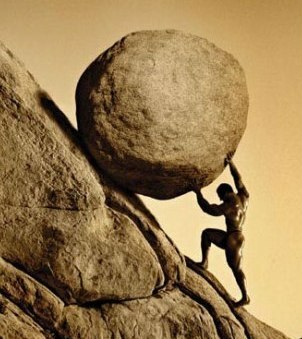 That rock you're pushing will clear the crest at some point. Keep your mind on effort and the clients will be there for you when we enter 2012. A harvest awaits.